An article of great value was published online, by the Norwegian "Dagbladet Magazine” in Norwegian Language in the title of: "-The Olympic Construction – By The Mass Graves”, reported by Astrid Meland, that makes it necessary to thank such blessed efforts for publishing an interesting report that contains a comprehensive field study about a forgotten nation that had lost its basic privileges as a respected European indigenous nation which was and still denied by genocide for its legitimate rights. SAYS NOTHING ABOUT TJERKESSERNE: Russian Prime Minister Putin was visiting in the upcoming Olympic city last month. 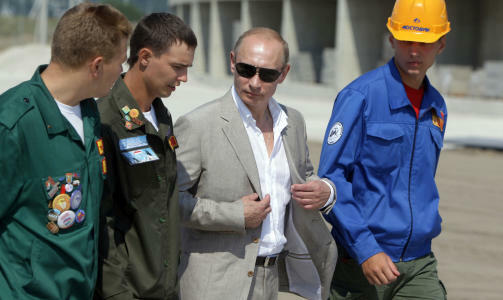 Photo: REUTERS / RIA Novosti / Pool / Alexei Druzhinin. 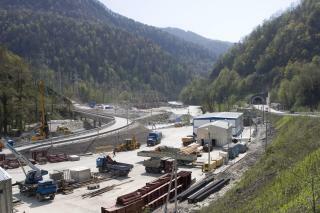 The built obstruction in the mountains of Sochi at the moment. Ski resorts in southwestern Russia, will house the Olympic Games in 2014.